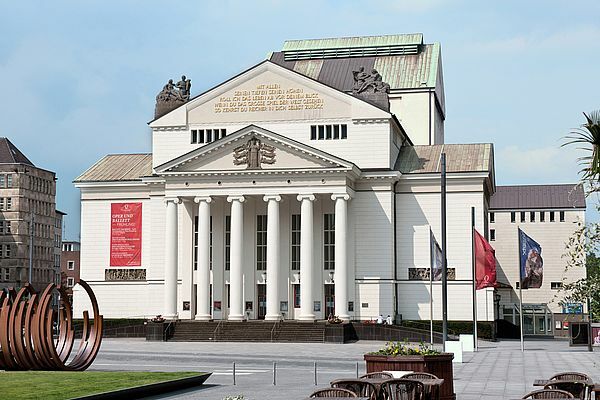 The works of Beckett and Brecht, Mozart and Wagner, and of course Goethe and Shakespeare are all performed on the stage of Theater Duisburg. After decades or even centuries, these plays, concerts and operas continue to fascinate the audience. The drive technology for the stage, however, had seen better days and therefore, the theater had new electrical equipment for backstage technology installed during the 2010/2011 season. Hoists, rods and other proven mechanical components as well as most existing geared motors continue to perform their duties, but are now controlled by a new system from industry specialist UNICAN. The high-availability stage automation system is a complete solution that fulfils the requirements of SIL 3. It includes HMI consoles, high-performance software, and custom-tailored enclosures with state-of-the-art axis controllers that are connected to dozens of drive units via new frequency inverters. This requirement also applied to the new systems for the Theater Duisburg. All in all, 74 drives in the so-called upper machinery (that is, drives used to move rope and chain hoists above the stage area) and 39 drives on six podiums and slopes in the lower machinery were modernized. For the new control solution, UNICAN installed three operating consoles: two with 2 x 22" and one with a 19" screen. The screens can be operated in an upright position or lying on the console. Input options are the touchscreen display and the keyboard integrated into the aluminum console which features various backlit special keys, two joysticks and a trackball. In addition to these fixed stations, UNICAN also delivered a handheld HMI with a 12" touchscreen. The largest part of the system installation, however, was taken up by customized enclosures for the more than one hundred drives, each of which is equipped with an axis control computer from the UNICAN ICU series. These intelligent electronic units operate regardless of the type of connected drives, and can therefore be used to control hydraulic and pneumatic solutions as well as electric ones. The controllers feature a double CAN interface, support CANopen and are equipped with two inputs for SSI encoders and an integrated emergency stop relay. UNICAN's axis control computers are available as dual channel versions for SIL 3 applications. 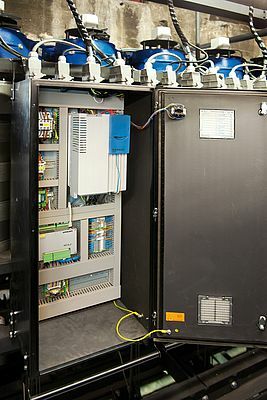 At Theater Duisburg, the axis control computers control electric motors. For that purpose, each of the more than one hundred customized enclosures is equipped with an SK 535-type frequency inverter from Nord Drivesystems. The stage drives required reliable power electronics that could seamlessly fit into the safety concept of UNICAN's extensive system solution, combining a suitable functional range with a convincing price/performance ratio. Nord 's current series of inverters for cabinet installation provided suitable devices. All inverters from Nord 's SK 500E series feature integrated brake management, a brake chopper and a line filter as well as sensorless current vector control. Even the basic model, which is equipped with five configurable control inputs, two analog inputs, one analog output, and two relay outputs, provides a wide range of connection options. For Theater Duisburg, SK 535E models in sizes 5 and 6 with an 11 kW and 22 kW performance were chosen from the SK 500E series which is currently available with rated motor outputs up to 37 kW. In addition to the basic features described above, these models also feature two digital input and two output channels and a TTL input for speed and torque control. Moreover, the SK 535E model features a "Safe Stop" function in compliance with EN 954-1 and EN 13849-1 (up to safety category 4, stop category 0 and 1) and comes with an on-board CANopen interface. A POSICON module that provides powerful positioning control functions is also included in delivery. Furthermore, the controller card of the SK 535E can be powered from a separate 24 V supply, allowing access to parameter data and the bus interface even if the mains power is switched off. This enables specific applications such as elevator evacuation and increases online availability. 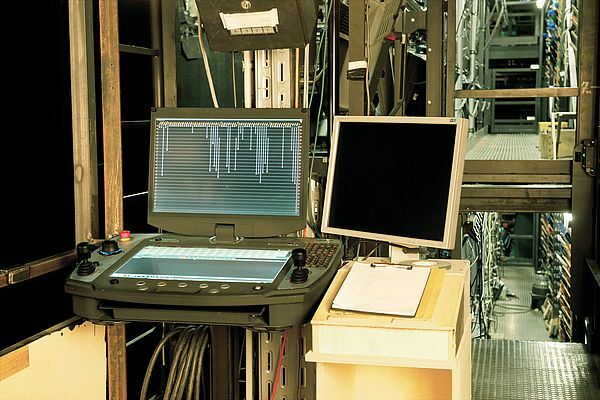 With new automation technology controlling more than one hundred drives in the upper and lower machinery, Theater Duisburg has been equipped with a system solution that fulfills the safety requirements of SIL 3 and enables easy operation as well as the programming of complete performances on touchscreen operating consoles. 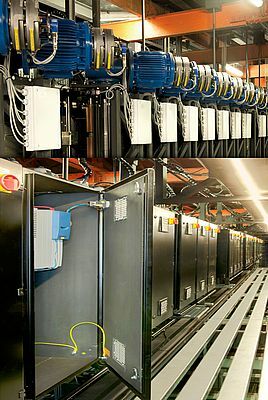 Numerous customized enclosures for the stage drives - which provide a functionally safe connection between the partially modernized electric motors and the state-of-the-art control system via new frequency inverters - are the core component of the electric equipment.